This is not going to be the most groundbreaking post that we ever write at Bushel.com. But it is useful for a few of you (and it was requested). So, what apps do we recommend for checking the weather (this list will completely change when we see who has a glance for the watch). 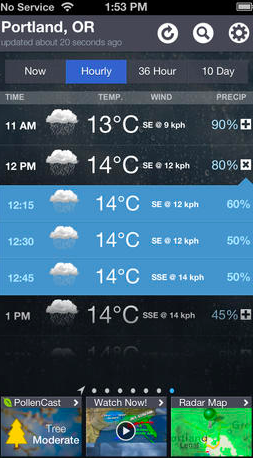 There’s no way to deny that one of the easiest ways to deploy weather apps to your users is to just not do anything. I use the Weather Channel app. This gives me airport weather, radar maps and puts the weather in Widgets. I also hear of a glance for the Apple Watch. Also, watch videos in the app! One of the prettier apps for sure. 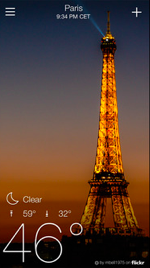 Beautiful images of the cities you track weather for. Lots of detailed information that can be granularly configured, hourly forecasts (which those of us who live where it snows checks out a lot) and other good bells and whistles. 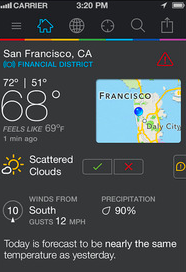 This app builds on top of the core features of the built-in Weather app, but gives widgets, health information (including air quality), satellite maps and a huge collection of weather stations to get more details on local weather patterns. It’s free, but only ad-free with an in-app purchase (note: Bushel doesn’t currently manage in app purchases for your users).